After last years parties, I really did cut back this year on the girls parties. If you don’t believe me, check out those links. 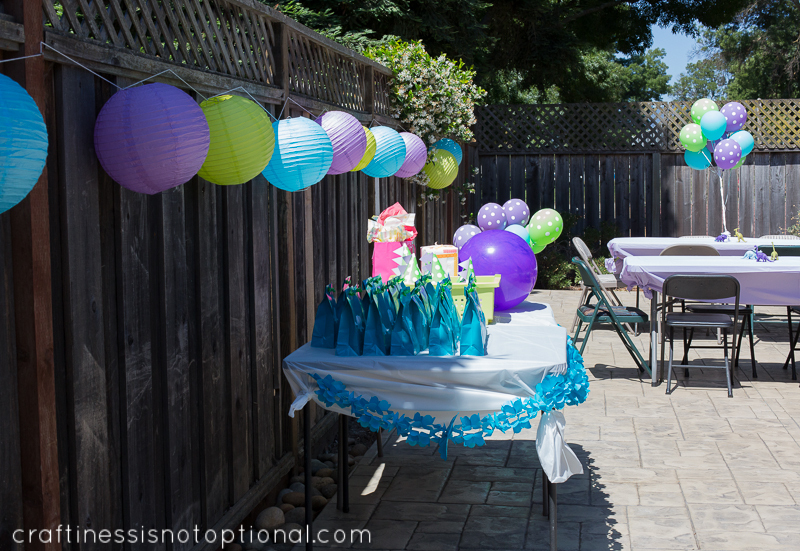 😉 I have a tendency to go way overboard with parties…lol! I get it from my mom. Thanks, mama. 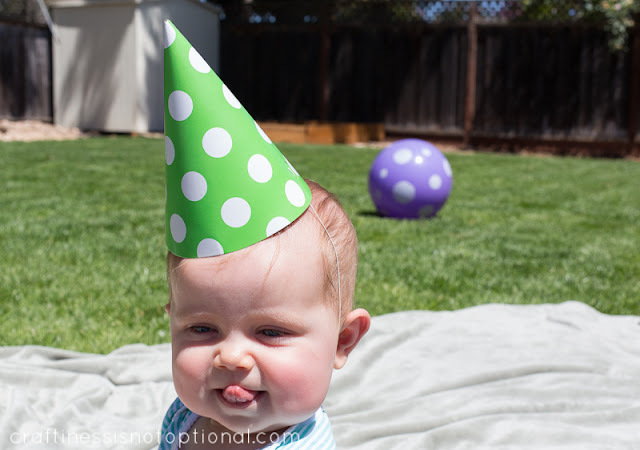 Anyways, it felt great to be more low key this year and also, we just did a small friends and moms playdate style party…so nice to have it over with earlier in the day, and ALSO we got to have it in OUR OWN BACKYARD. I am shouting this at you because of how darn excited I am about this. We’ve had almost all our girls birthday parties at my inlaws because our house isn’t big enough and our backyard wasn’t finished yet. It’s still not totally complete, but enough that we can use it for some partays! woohoo! Charlotte went through a dino phase a few months ago, and although it’s cooled a little, she still loves them, and was soo excited for her party this year (the first year she’s really been able to look forward to it, really.) 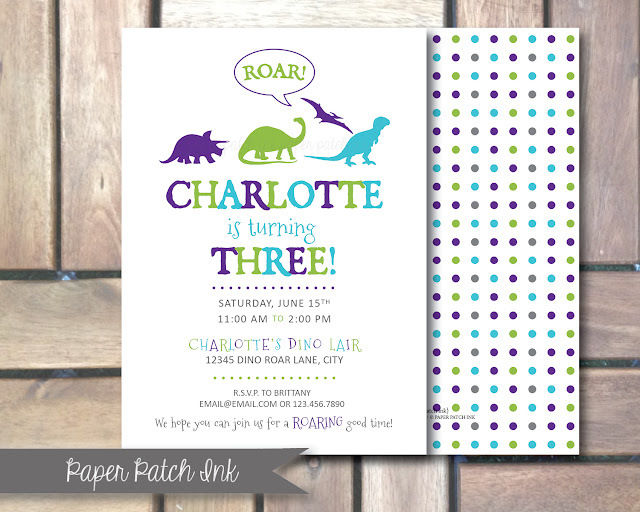 We picked out a purple, aqua, and lime green color scheme and took off from there! My friend Tara, designed these super sweet invites for the party! She has an etsy shop, Paper Patch Ink, with tons of adorable designs! So let’s jump right in.Oh wait, first I have to apologize for the pictures. Bright sunlight is not the best for taking great pics, so let’s just pretend they’re artsy and properly exposed. Also this post has a lot of links to Amazon, who I am an affiliate with, that’s just where I got lots of my stuff. cause they’re awesome. Just FYI. Decorations! I got some paper lanterns (Oriental Trading) and strung them along the fence-I have a feeling this will be a go-to decorating scheme with future parties! 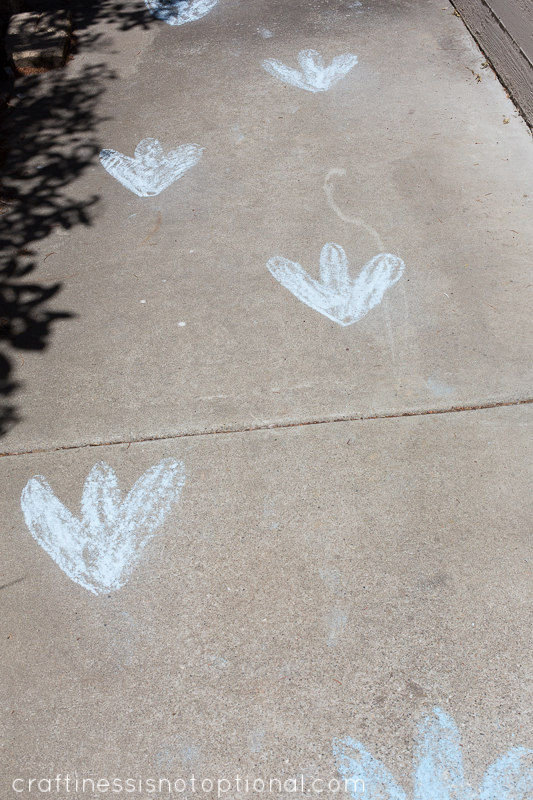 Leading into our yard I scribbled some dino footprints with chalk….at least…they sorta look like dino footprints…tell me they do! 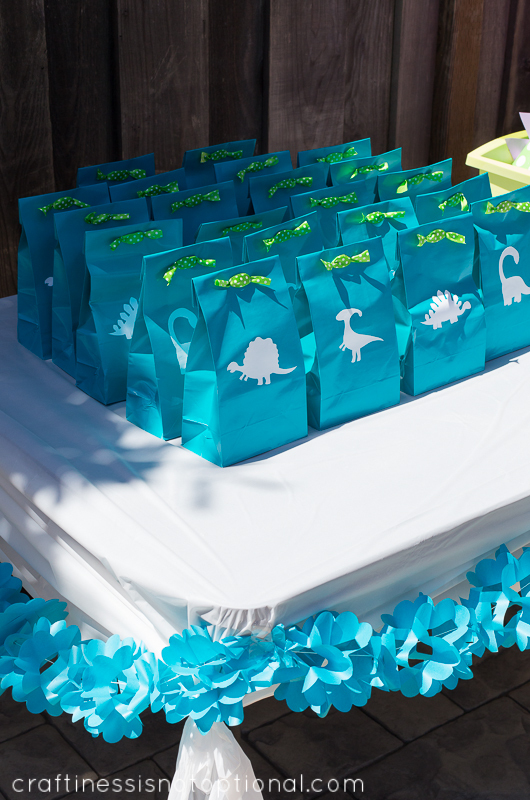 Favor bags were in teal paper bags and got a dino vinyl sticker on the front (cut out with my Silhouette) and green polka dot ribbon, with requisite dino goodies inside. Oh and here’s another one! 😉 That’s her favorite trick to do lately…try and touch her tongue to her nose. Cutest. thing. ever. I grabbed some polka dot balloons (affiliate link) and some aqua ones from Walmart and filled them up-they’re surrounded by some fun plastic dinos (affiliate link) that I spray painted to match the theme! 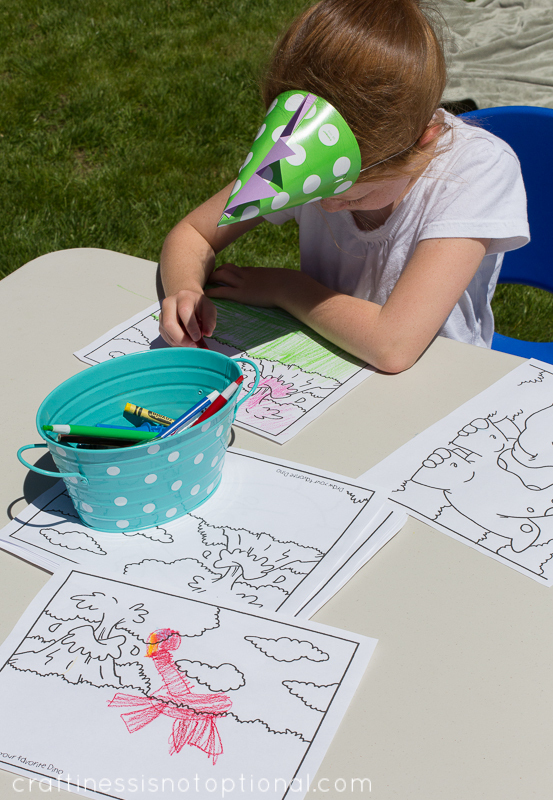 I printed off these dino coloring pages and had them out to color (the only “game” I provided…whatever-she’s 3.) The little aqua tins I got at Michaels. 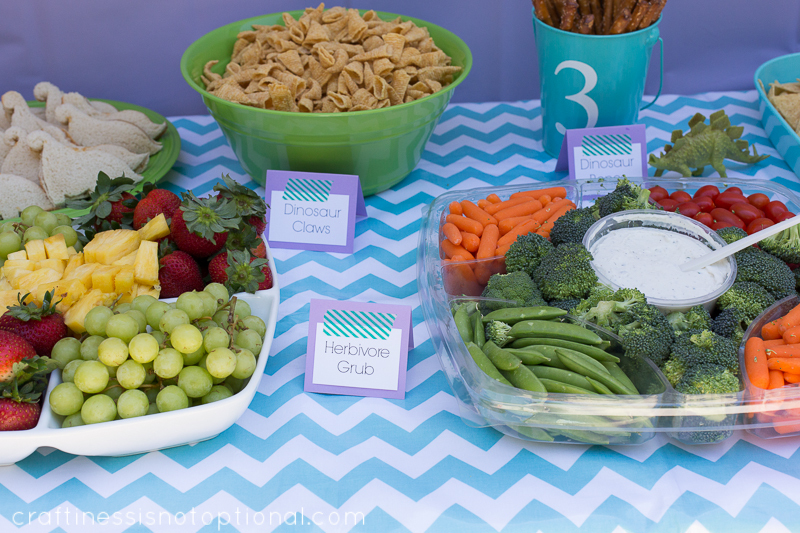 The food & dessert table! All in one. Combo meal. 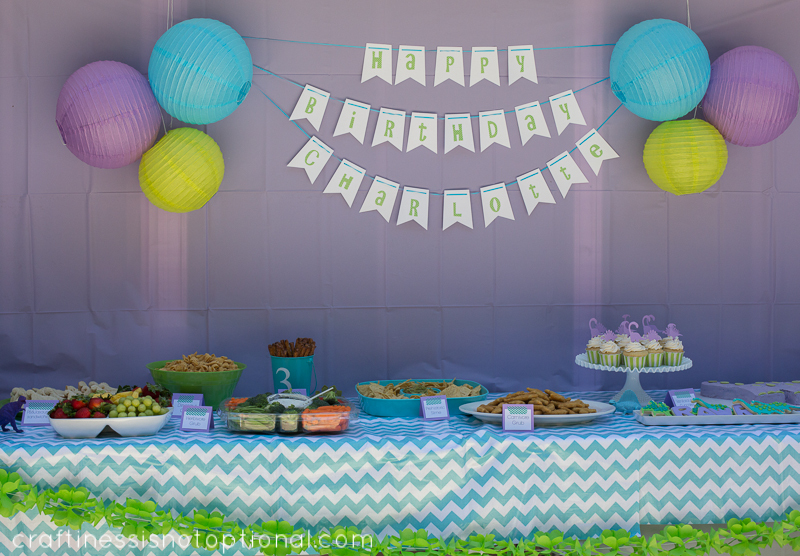 The backdrop was really simple-just a plastic tablecloth hung up, then I added a banner made on my Silhouette, and some paper lanterns hung up on either side.The tablecloth is some laminated cotton from my sponsor, Oilcloth Addict! I love this stuff for tablecloths. Easy to wipe down and re-usable! 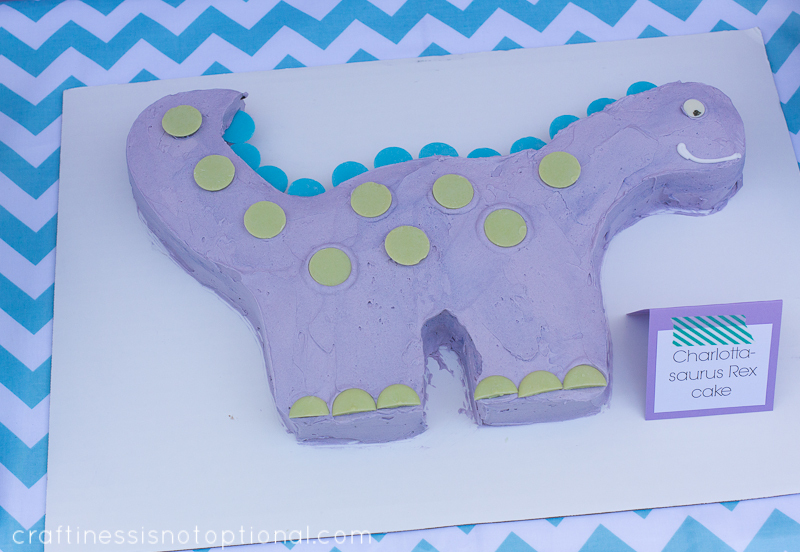 For the cake-of course I had to go dino! It’s not my best work or hardest cake, but it’s what Charlotte wanted and it was super easy. Win-win! I used this template and video for the cake! 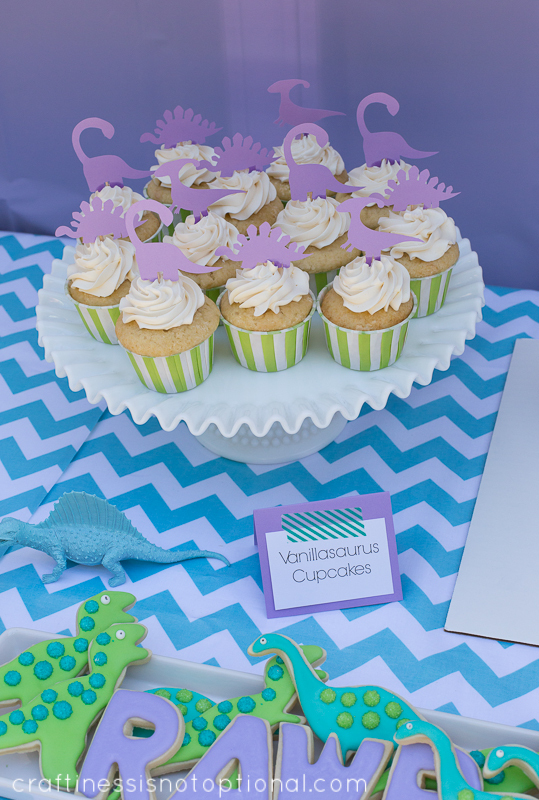 Then I made some Vanilla(saurus) cupcakes, in some cute striped liners and frosted them with Swiss Meringue Buttercream (recipe here, just leave out the caramel), and stuck some toppers I made with my Silhouette, toothpicks, and some cardstock on top. I love doing fun chocolate lollipops! 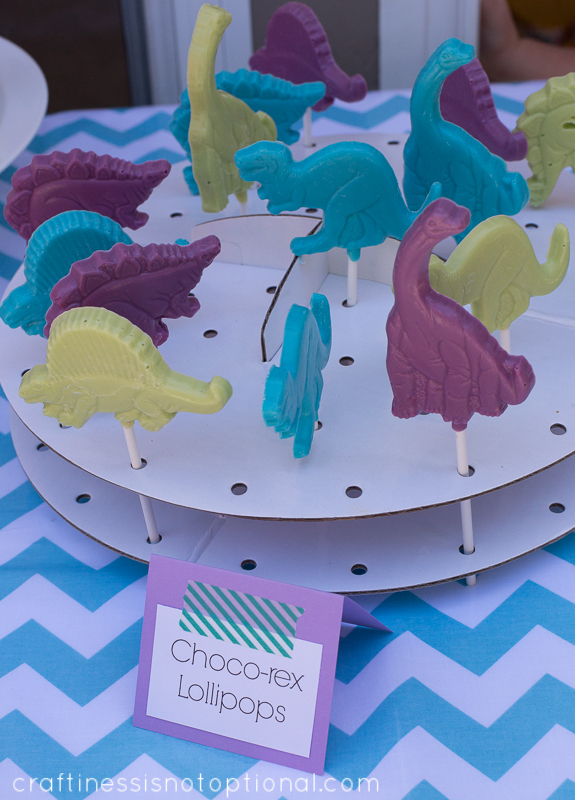 I got this dino lollipop mold (affiliate link) and whipped some out earlier in the week. These are great to do ahead of time! 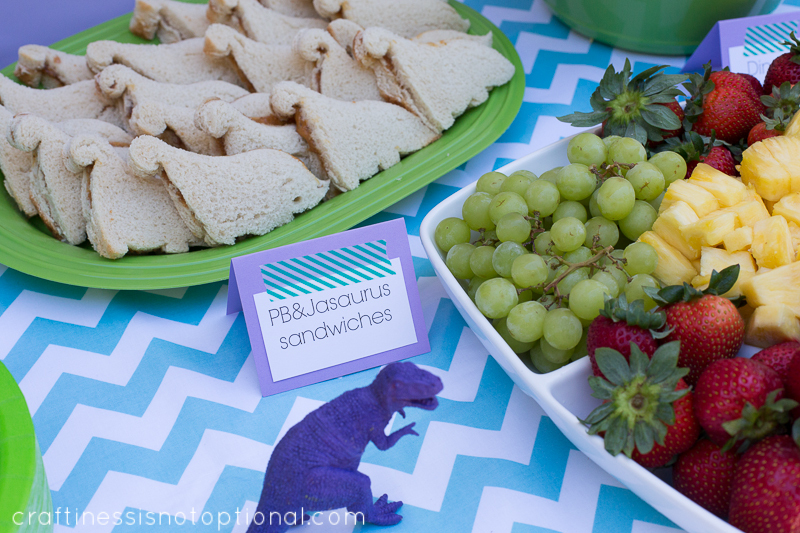 Made some PB&J(asaurus….I was running out of clever names…) sandwiches with this sandwich cutter (affiliate link) See the purple T-Rex stalk it’s prey…he must be a vegetarian T-Rex. Next! Grub for the herbivores-aka fruits and veggies! 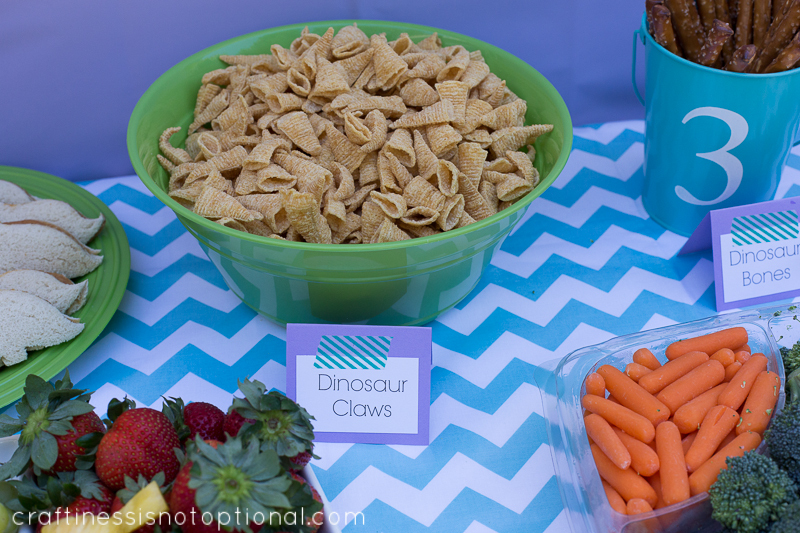 And some Dino Claws-aka Bugles. 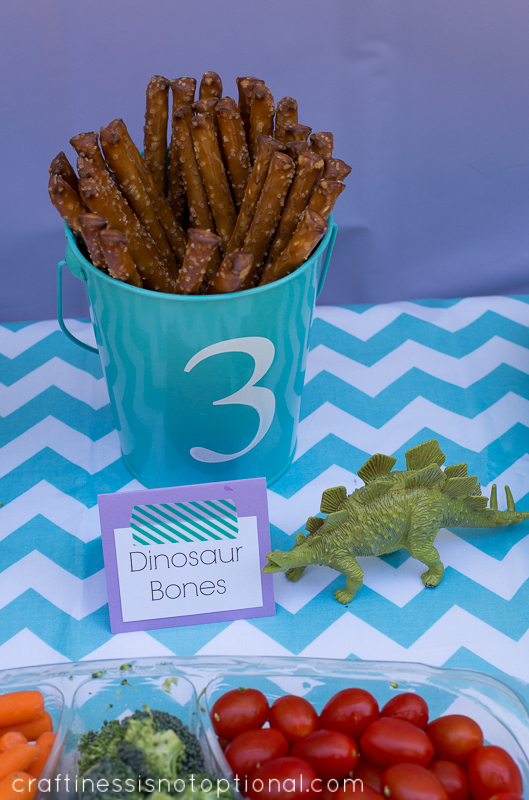 And Dino bones…aka pretzels. 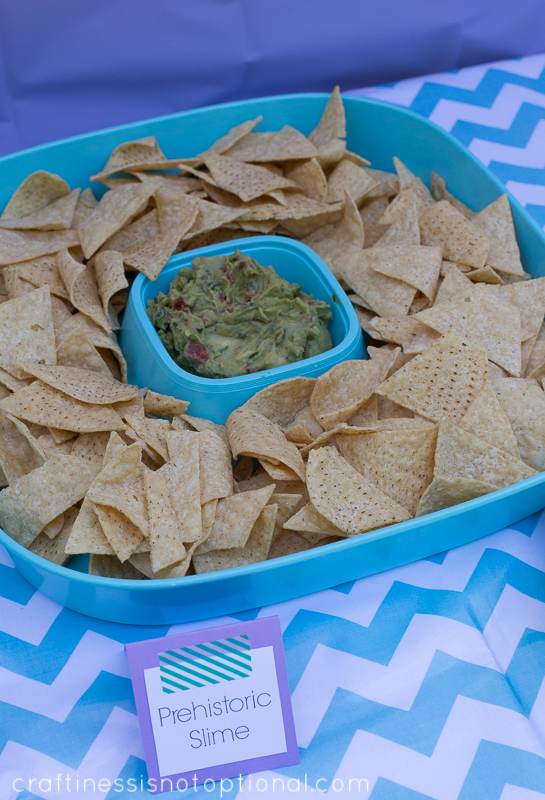 We have some of these leftover and I’m thinking…dip them in chocolate…right? …and some grub for the carnivores! 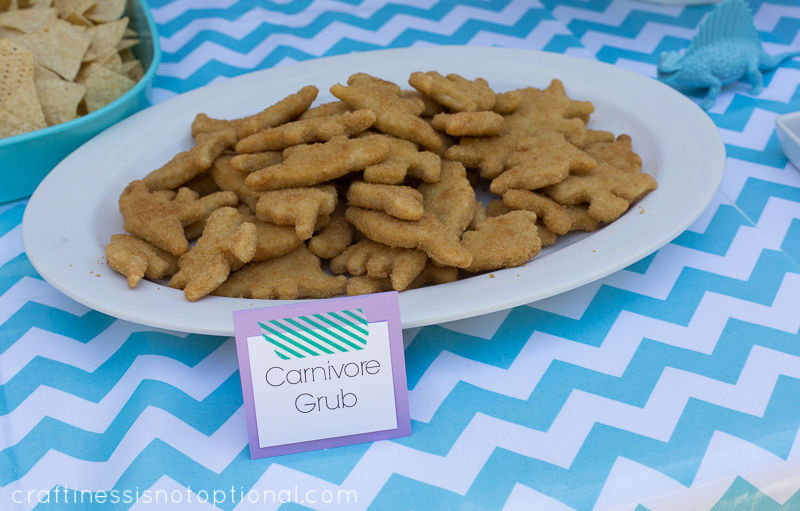 These are those dino shaped chicken nuggets from Costco. Couldn’t not serve these-they’re perfect for the theme! And some yummy Prehistoric slime aka guacamole. YuM! 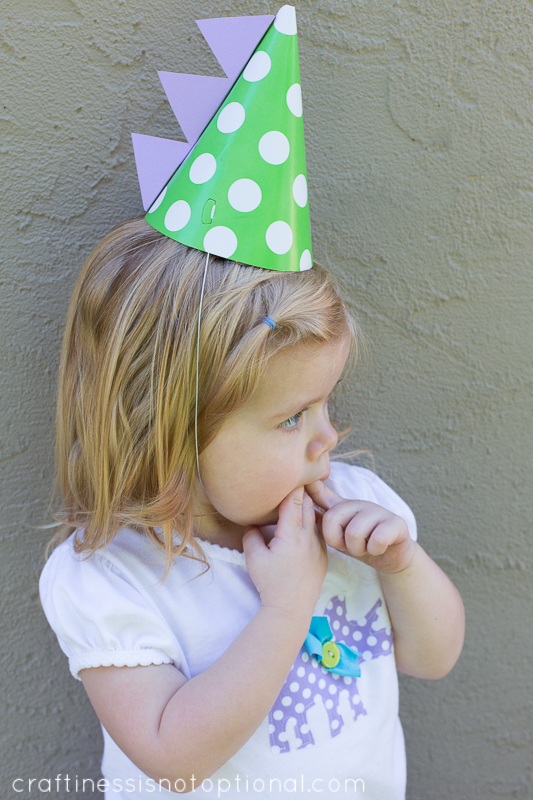 Little Miss C had a great time at her party and so did the other kids! We’ll call this party a success! Wow, that looks so great! What an effort! Really well decorated: very professional but homemade. And we can see the love in those things. Themes parties are starting to be common in Portugal, but usually people (with momey!) deliver it to expert companies or call me crazy to do it myself… Besides me, and in my circle of friends and colleagues at work, only other mother is crazy enough to try this. My recent party was in May for my youngest daughter 3rd birthday. Miffy was the theme. Adorable! I love all your parties. What great memories for your girls! And I can’t wait to see the rest of Charlotte’s outfit! Awesome job Jessica! My daughters party is tomorrow and its chevron/dot themed. I was going to add doc mcstuffins but she added too much work to my plate… Wish i had my silouette! Everything looked so fun and yummy. Looking forward the seeing Charlottes outfit! Wow! What a GREAT party. And you have given me lots of ideas for future use, so thank you! Wow! What a GREAT party! And you have given me some really great ideas, so thank you! No, this isn’t over the top at all! 🙂 Looks beautiful–so glad you could enjoy your backyard. What an awesome theme party. And it’s totally amazing that you did it all yourself! I hope that I can be that crafty one day! Love, Love, Love your parties! Also loving the paper lanterns too. Thank you for sharing! Awesome job! Love all the details, you are always so good at that. The hats might be my favorite!! 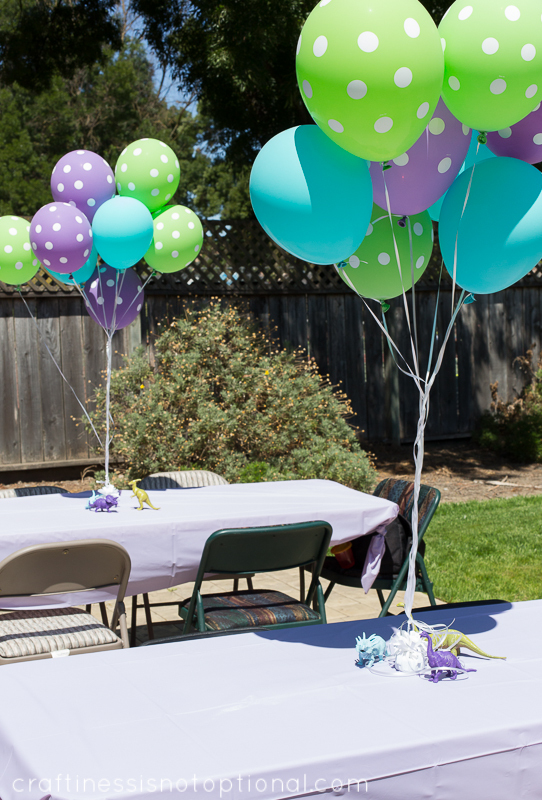 Your parties always look amazing! Such a lucky birthday girl. 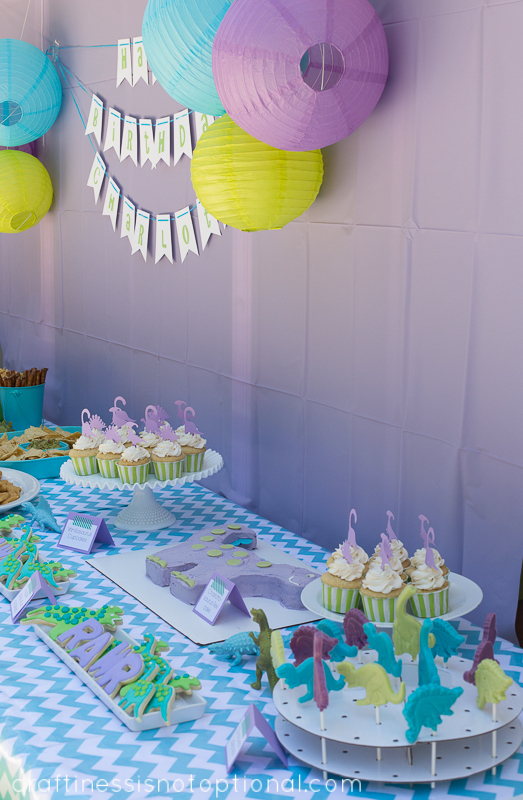 I think these would be some of my favorite memories as a kid- the awesome parties my mom did! Maybe I should step up my game? 🙂 Awesome job, I totally wish I was 3 right now. Really cute! Loved the dino footprints on the ground! Happy Birthday Charlotte! What an amazing job Jess. You always throw the most adorable parties! Beautiful party! You are such an inspirationand I can’t wait to see the photos of her outfit to! 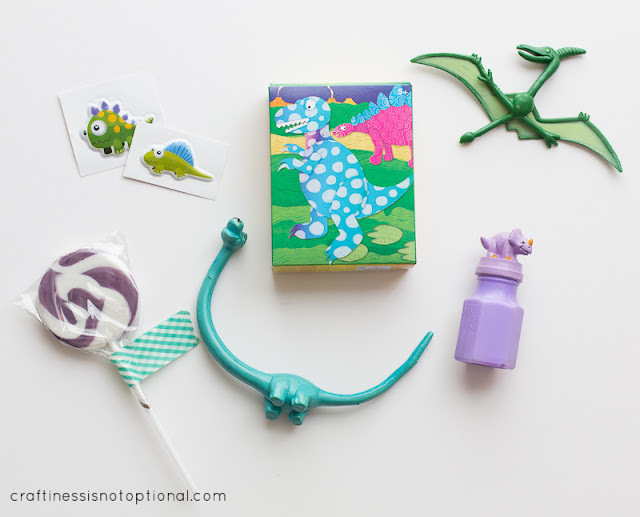 Absolutely gorgeous girly dinosaury party. Happy birthday Charlotte! Glad she survived. 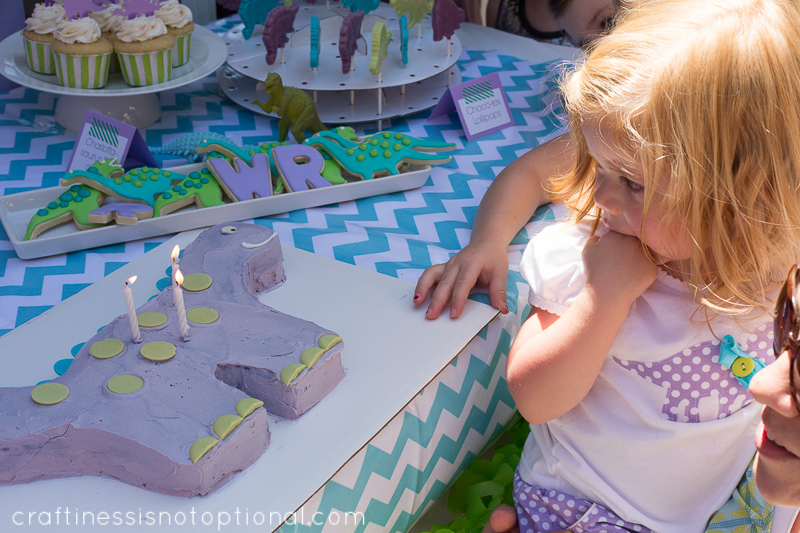 Loved the Charlottasaurus Rex cake and her shirt. awesome as usual! 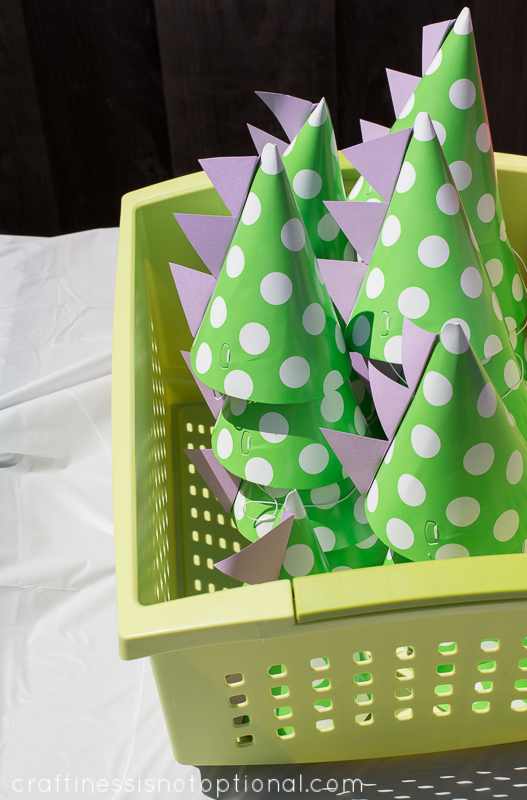 Thanks for sharing your fabulous party inspiration. Je suis totalement admirative de votre imaginaire et de vos réalisations. Even when you cut back, your parties are incredible! I love how the colors work together, and I particularly love your dino cookies. Great job! i love the invitation card and the birthday party concept/layout. First of all, I’m pretty sure I was following your blog when you announced you were pregnant with Charlotte, so now I feel kinda old. 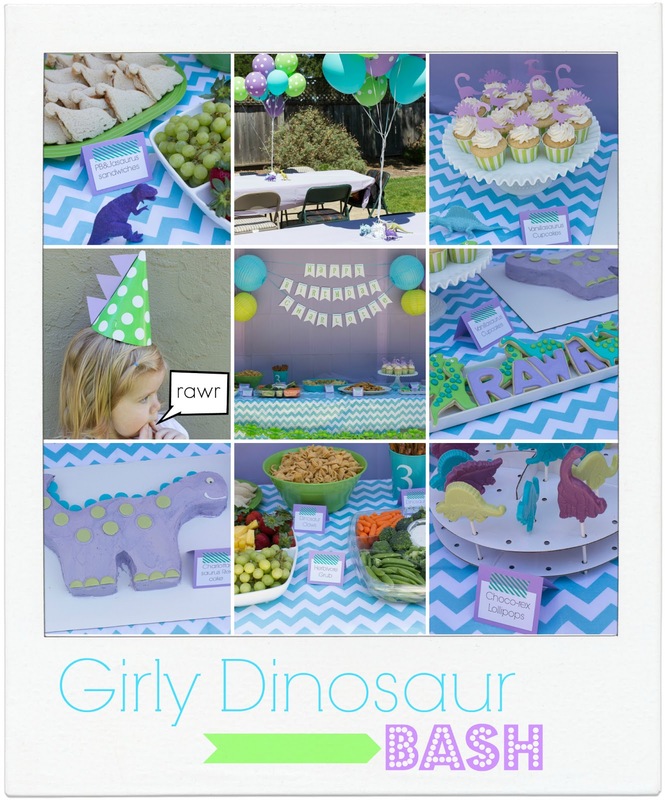 But happy birthday to your big 3 year old and I love that you made a “feminine” dino party! You’re a pro. What an AWESOME party! 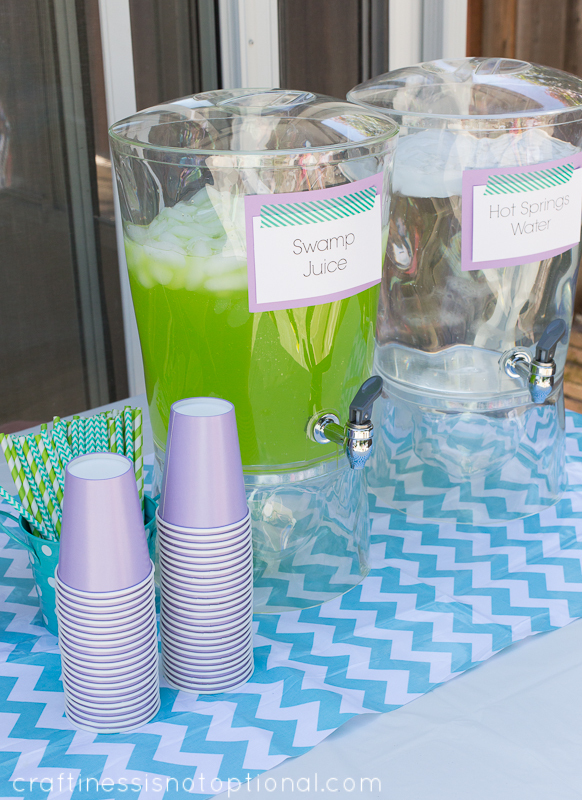 That’s some tasty looking swamp juice! Love all of it!!! She’s such a cutie patootie! 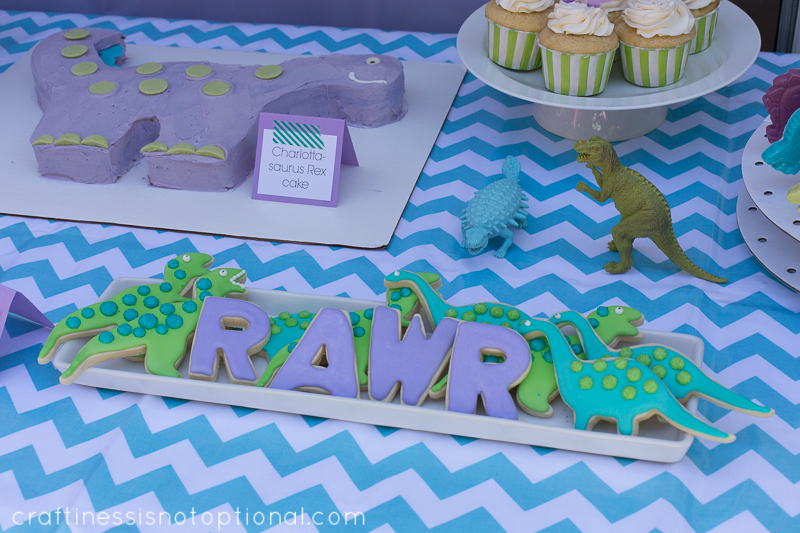 I love when a party reflects so much of the child’s personality at each given age. You still went way over the top and it was totally worth it! Good job!!! Wow! I have been looking for girly dinosaur party inspiration and it looks like I’ve hit the jackpot here! Thanks for all of the great ideas!! I just have a question…how much 7-up do you use? and Can it be sprite? totally! I think I used 2 2-liter bottles. This is amazing! My daughter is currently asking for a girly dino 3rd birthday. Thanks so much for sharing this with us. 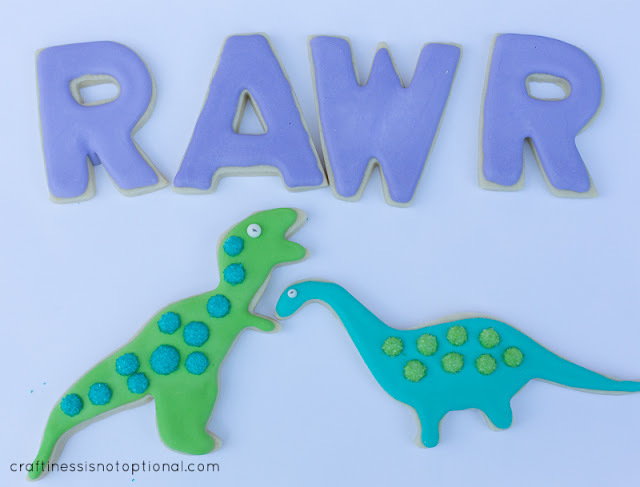 I was wondering where these particular cookie cutters are from– they are so cute! Love it!! Excellent job, wondering where you found the dinosaur pattern for the silloutte? Would love to use it! Thanks! Thanks for the inspiration! I know it has been a few years, but do you have any info on her outfit? Love! Hi! I from Brazil… i love this website. Tks for you inspiration dear. You did an amazing job w everything! I got a ton of ideas for my two toddlers upcomming dino party. Thank you for sharing!